Galway County Council (Irish : Comhairle Chontae na Gaillimhe) is the authority responsible for local government in County Galway, Ireland. As a county council, it is governed by the Local Government Act 2001. The council is responsible for housing and community, roads and transportation, urban planning and development, amenity and culture, and environment. The council has 39 elected members. Elections are held every five years and are by single transferable vote. The head of the council has the title of Cathaoirleach . The county administration is headed by a Chief Executive. The county seat is at Áras an Chontae (County Hall) in Galway city. In Ireland, local government functions are mostly exercised by thirty-one local authorities, termed County, City, or City and County Councils. The principal decision-making body in each of the thirty-one local authorities is composed of the members of the council, elected by universal franchise in local elections every five years. Irish Local Authorities are the closest and most accessible form of Government to people in their local community. Many of the authorities' statutory functions are, however, the responsibility of ministerially appointed career officials termed Chief executives. The competencies of the city and county councils include planning, transport infrastructure, sanitary services, public safety and the provision of public libraries. County Galway is a county in Ireland. It is located in the West of Ireland, part of the province of Connacht. 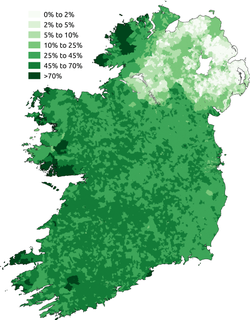 A local electoral area (LEA) is an electoral area for elections to local authorities in Ireland. All elections use the single transferable vote. The boundaries of LEAs are defined by statutory instrument in terms of lower-level units called electoral divisions (EDs). An electoral division is the smallest legally defined administrative areas in Ireland for which small area population statistics are published from the Census. There are a total of 3,440 electoral divisions in Ireland. They are used to define local electoral areas for elections to county and city councils and to define constituencies in elections to Dáil Éireann. Until 1994, they were known as district electoral divisions (DED) in the county council areas and wards in the five county boroughs which were then in existence. Electoral divisions are local administrative units within the NUTS system of the European Union. The following were elected at the 2014 Galway County Council election, under the boundaries which existed at the time. Galway City Council is the authority responsible for local government in the city of Galway in Ireland. As a city council, it is governed by the Local Government Act 2001. The council is responsible for housing and community, roads and transportation, urban planning and development, amenity and culture, and environment. The council has 18 elected members. Elections are held every five years and are by single transferable vote. The head of the council has the title of Mayor. The city administration is headed by a Chief Executive, Brendan McGrath. The council meets at City Hall, College Road, Galway. Cork City Council is the authority responsible for local government in the city of Cork in Ireland. As a city council, it is governed by the Local Government Act 2001. Prior to the enactment of the 2001 Act, the council was known as Cork Corporation. The council is responsible for housing and community, roads and transportation, urban planning and development, amenity and culture, and environment. The council has 31 elected members. Elections are held every five years and are by single transferable vote. The head of the council has the honorific title of Lord Mayor of Cork. The city administration is headed by a Chief Executive, Ann Doherty. The council meets at Cork City Hall. Kildare County Council is the authority responsible for local government in County Kildare, Ireland. As a county council, it is governed by the Local Government Act 2001. The council is responsible for housing and community, roads and transportation, urban planning and development, amenity and culture, and environment. The council has 40 elected members. Elections are held every five years and are by single transferable vote. The head of the council has the title of Mayor. The county administration is headed by a Chief Executive, Peter Carey. The county town is Naas. Donegal County Council is the authority responsible for local government in County Donegal, Ireland. As a county council, it is governed by the Local Government Act 2001. The council is responsible for housing and community, roads and transportation, urban planning and development, amenity and culture, and environment. It has 37 elected members. Elections are held every five years and are by single transferable vote. The head of the council has the title of Cathaoirleach. The county administration is headed by a Chief Executive, Séamus Neely. The county town is Lifford. Cavan County Council is the authority responsible for local government in County Cavan, Ireland. As a county council, it is governed by the Local Government Act 2001. The council is responsible for housing and community, roads and transportation, urban planning and development, amenity and culture, and environment. The council has 18 elected members. Elections are held every five years and are by single transferable vote. The head of the council has the title of Cathaoirleach (Chairperson). The county administration is headed by a Chief Executive, Tommy Ryan. The county town is Cavan town. Carlow County Council is the authority responsible for local government in County Carlow, Ireland. As a county council, it is governed by the Local Government Act 2001. The council is responsible for housing and community, roads and transportation, urban planning and development, amenity and culture, and environment. The council has 18 elected members. Elections are held every five years and are by single transferable vote. The head of the council has the title of Cathaoirleach (Chairperson). The county administration is headed by a Chief Executive, Kathleen Holohan. The county town is Carlow town. Kerry County Council is the authority responsible for local government in County Kerry, Ireland. As a county council, it is governed by the Local Government Act 2001. The council is responsible for housing and community, roads and transportation, urban planning and development, amenity and culture, and environment. The council has 33 elected members. Elections are held every five years and are by single transferable vote. The head of the council has the title of cathaoirleach. The county administration is headed by a Chief Executive, Moira Murrell. The county town is Tralee. Meath County Council is the authority responsible for local government in County Meath, Ireland. As a county council, it is governed by the Local Government Act 2001. The council is responsible for housing and community, roads and transportation, urban planning and development, amenity and culture, and environment. The council has 40 elected members. Elections are held every five years and are by single transferable vote. The head of the council has the title of Cathaoirleach (Chairperson). The county administration is headed by a Chief Executive, Jackie Maguire. The county town is Navan. Louth County Council is the authority responsible for local government in County Louth, Ireland. As a county council, it is governed by the Local Government Act 2001. The council is responsible for housing and community, roads and transportation, urban planning and development, amenity and culture, and environment. The council has 29 elected members. Elections are held every five years and are by single transferable vote. The head of the council has the title of Cathaoirleach (Chairperson). The county administration is headed by a Chief Executive, Joan Martin. The county town is Dundalk. Monaghan County Council is the authority responsible for local government in County Monaghan, Ireland. As a county council, it is governed by the Local Government Act 2001. The council is responsible for housing and community, roads and transportation, urban planning and development, amenity and culture, and environment. The council has 18 elected members. Elections are held every five years and are by single transferable vote. The head of the council has the title of Mayor. The county administration is headed by a Chief Executive, Eamonn O'Sullivan. The county town is Monaghan town. Westmeath County Council is the authority responsible for local government in County Westmeath, Ireland. As a county council, it is governed by the Local Government Act 2001. The council is responsible for housing and community, roads and transportation, urban planning and development, amenity and culture, and environment. The council has 20 elected members. Elections are held every five years and are by single transferable vote. The head of the council has the title of Cathaoirleach (Chairperson). The county administration is headed by a Chief Executive, Pat Gallagher. The county town is Mullingar. Wicklow County Council is the authority responsible for local government in County Wicklow, Ireland. As a county council, it is governed by the Local Government Act 2001. The council is responsible for housing and community, roads and transportation, urban planning and development, amenity and culture, and environment. The council has 32 elected members. Elections are held every five years and are by single transferable vote. The head of the council has the title of Cathaoirleach (Chairperson). The county administration is headed by Chief Executive, Frank Curran. The county town is Wicklow town. 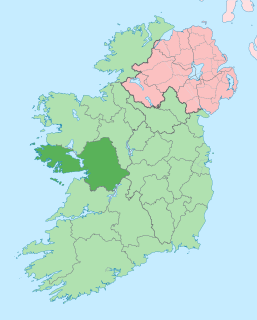 Roscommon County Council is the authority responsible for local government in County Roscommon, Ireland. As a county council, it is governed by the Local Government Act 2001. The council is responsible for housing and community, roads and transportation, urban planning and development, amenity and culture, and environment. The council has 18 elected members. Elections are held every five years and are by single transferable vote. The head of the council has the title of Cathaoirleach (Chairperson). The county administration is headed by a Chief Executive, Eugene Cummins. The county town is Roscommon town. Leitrim County Council is the authority responsible for local government in County Leitrim, Ireland. As a county council, it is governed by the Local Government Act 2001. The council is responsible for housing and community, roads and transportation, urban planning and development, amenity and culture, and environment. The council has 18 elected members. Elections are held every five years and are by single transferable vote. The head of the council has the title of Cathaoirleach (Chairperson). The county administration is headed by a Chief Executive, Lar Power. The county town is Carrick-on-Shannon. Sligo County Council is the authority responsible for local government in County Sligo, Ireland. As a county council, it is governed by the Local Government Act 2001. The council is responsible for housing and community, roads and transportation, urban planning and development, amenity and culture, and environment. The council has 18 elected members. Elections are held every five years and are by single transferable vote. The head of the council has the title of Cathaoirleach (Chairperson). The county administration is headed by a Chief Executive, Ciarán Hayes. The county town is Sligo town. Offaly County Council is the authority responsible for local government in County Offaly, Ireland. As a county council, it is governed by the Local Government Act 2001. The council is responsible for housing and community, roads and transportation, urban planning and development, amenity and culture, and environment. The council has 19 elected members. Elections are held every five years and are by single transferable vote. The head of the council has the title of Cathaoirleach (Chairperson). The county administration is headed by a Chief Executive, Anna-Marie Delaney. The county town is Tullamore. Longford County Council is the authority responsible for local government in County Longford, Ireland. As a county council, it is governed by the Local Government Act 2001. The council is responsible for housing and community, roads and transportation, urban planning and development, amenity and culture, and environment. The council has 18 elected members. Elections are held every five years and are by single transferable vote. The head of the council has the title of Mayor. The county administration is headed by a Chief Executive, Tim Caffrey. The county town is Longford town. Cork County Council is the authority responsible for local government in County Cork, Ireland. As a county council, it is governed by the Local Government Act 2001. The council is responsible for housing and community, roads and transportation, urban planning and development, amenity and culture, and environment. The council has 55 elected members. Elections are held every five years and are by single transferable vote. The head of the council has the title of Mayor. The county administration is headed by a Chief Executive, Tim Lucey. The county seat is Cork County Hall in Cork. Fingal County Council is the authority responsible for local government in the county of Fingal, Ireland. It is one of three local authorities that comprised the former Dublin County Council before its abolition and one of four councils in the Dublin Region. As a county council, it is governed by the Local Government Act 2001. The council is responsible for housing and community, roads and transport, urban planning and development, amenity and culture, and environment. The council has 40 elected members. Elections are held every five years and are by single transferable vote. The head of the council has the title of Mayor. The county administration is headed by a Chief Executive, Paul Reid. The county town is Swords. Limerick City and County Council is the authority responsible for local government in the City of Limerick and County Limerick in Ireland. It came into operation on 1 June 2014 after the 2014 local elections. It was formed by the merger of Limerick City Council and Limerick County Council under the provisions of the Local Government Reform Act 2014. The city and county administration is headed by a Chief Executive, Conn Murray. The administrative centre is Limerick. ↑ "S.I. No. 618/2018 - County of Galway Local Electoral Areas and Municipal Districts Order 2018". 19 December 2018. Retrieved 23 February 2019. ↑ "Local Elections 2014: Results" (PDF). Department of Housing, Planning and Local Government . p. 146–152. Retrieved 31 January 2019. ↑ As Republican Sinn Féin are not a registered political party, Ó Curraoin is officially an independent councillor.